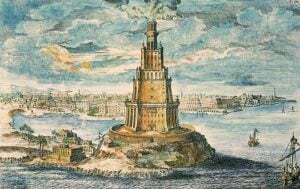 The Lighthouse of Alexandria lies on Egypt’s Northern coast. During ancient times it served as a primary port center for commerce and trade linking Europe with the Middle East and all other points along the Mediterranean Sea. As the port grew to be one of the largest cities on earth, second only to Rome, the Pharaoh, Ptolemy, needed a way to ensure that ships coming to Egypt knew exactly where they were going. So he ordered the construction of the world’s first lighthouse. 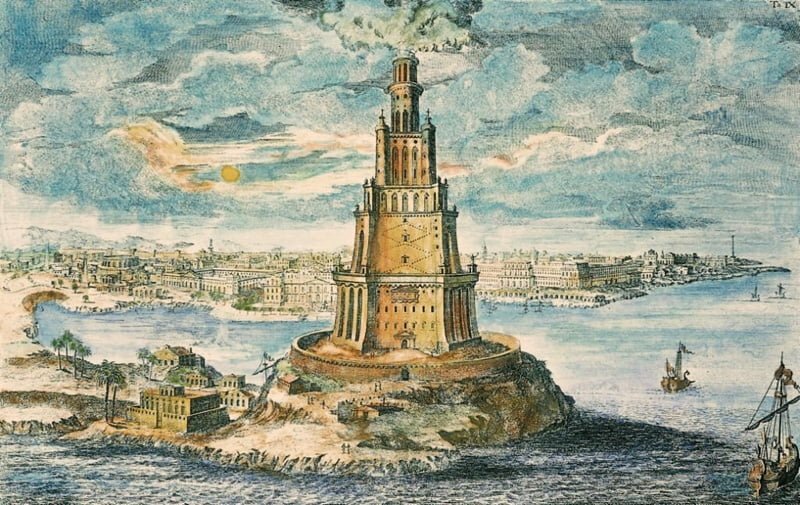 The great Pharos, also known as the Lighthouse of Alexandria took 12 years to complete and was finished during the reign of Ptolemy’s son, Ptolemy II. This Ancient Wonder of the World stood as tall as the Statue of Liberty – the only building taller at the time was the great pyramid of Giza – and it was built mostly of solid limestone. It would have been a very impressive sight to the ancient Egyptians and all who visited the port. Its immense size meant it was the first vertical yardstick to be used to measure the size of the earth. By day a plume of smoke streamed from the top and by night its light shone for miles around, making it very visible to trading ships coming in from the Mediterranean. The ships that came and went from Alexandria with the help of its lighthouse also brought great knowledge. Legend has it that any book brought on any ship was seized and copied while the ship was in port, one copy of the book was given to the legendary Library of Alexandria and the original given back to its rightful owner. 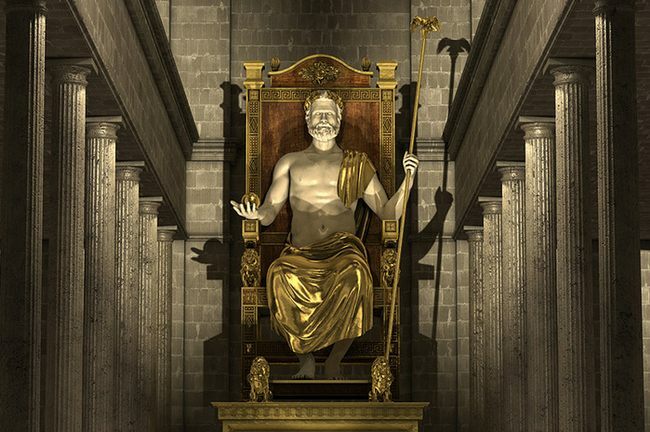 This is how the Library of Alexandria gained so many books, attracting many scholars to study there. This Lighthouse has made a lasting impact on world culture as the word for the lighthouse in many languages including Greek, Persian, French, Spanish, Italian, Bulgarian, Romanian and Portuguese comes from Pharos; the original name for this great work of architecture. The building is said, by many accounts, to have had a square base, an octagonal middle section, and a circular upper section, a design which mimics minarets used commonly in Islamic architecture for mosques and other buildings for centuries. Its design inspired the George Washington Masonic National Memorial in the United States. This towering lighthouse stood guarding Egypt’s shores for over 1 600 years. It remained unmoved by tidal waves, storms and even earthquakes until one fateful day in around 1300AD, the ancient wonder of the world crashing down. 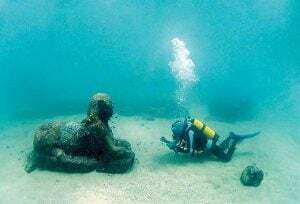 For seven hundred years the remains of this ancient wonder lay deep in the Mediterranean Sea until in 1994 a team of divers and archeologists found what they believe are pieces of the lighthouse. The Egyptian government is working with UNESCO to mark the area where the remains lie A World Heritage Site in order to ensure its preservation. In May 2015, a building plan was submitted to Alexandria’s governor Dr. Mostafa Amin – a representative for Egypt’s Supreme Council for Antiquities – to rebuild the lighthouse. This venture will change the shores of Egypt for centuries.